If the Web is the City, Are Apps the Gated Suburbs? 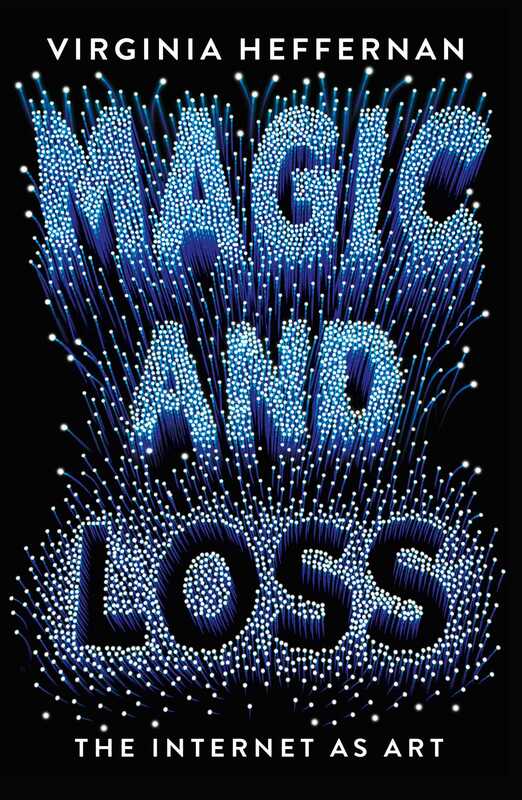 I’ve recently read, with interest, a book by Virginia Heffernan entitled Magic and Loss: The Internet As Art, and it seems to mesh quite nicely with some of the exploration that had been done in the Networked Narratives experiment. 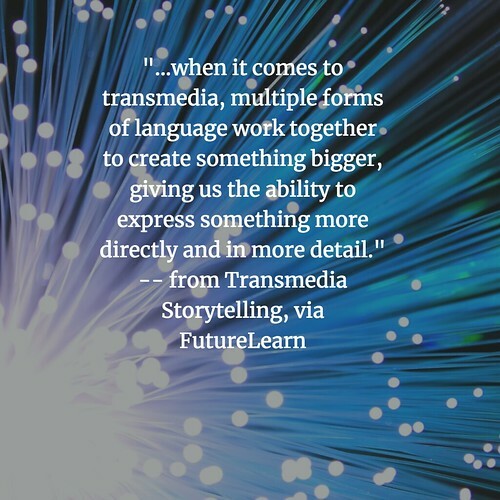 As the title suggests, Heffernan proposes that we view the Internet itself as a huge canvas of realistic art, and then she dives into elements like design, text, images and more to explore these ideas through a networked lens. In the chapter on Design, she notes that because the Web is both a commercial space and a collaborative space, it has become a messy sprawl of links, images, advertisements, and more. As a result, the experience of many users is far from ideal. Is this true? Does the metaphor hold? I guess I had never really considered the connections but she raises some intriguing points. So, as we talked about the nature of “civic imagination” in Networked Narratives and built our own “Arganee World,” we also considered what we meant by public spaces. 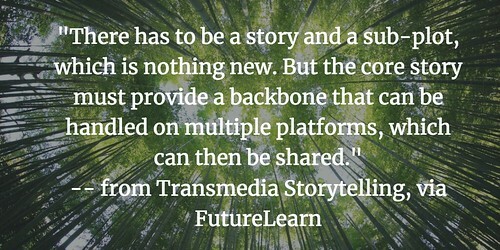 A further point of discussion might have been how to “design elements” can play a larger role in the permanence of online spaces, and is connected directly to how much a user invests in the experience. I guess one of the larger questions remains: What do we give up when we move into any gated community? What do we trade for our security? 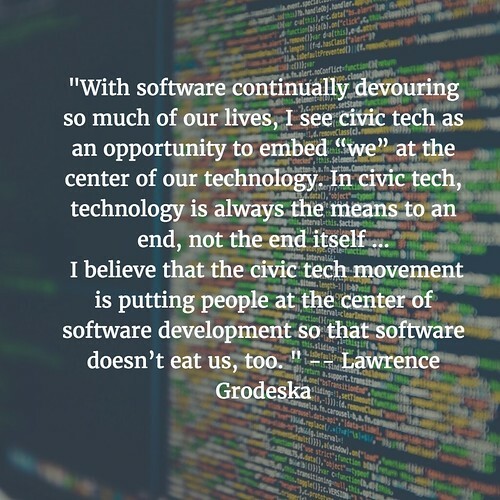 There is a certain beauty in the chaotic mess of the Internet — the expected discovery or connection — as well as some real ugliness — trolls and negative comments and attacks — and we cede some authority to app developers when we move into the app on our mobile device. 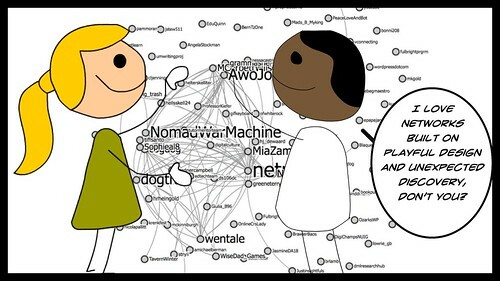 During one summer’s CLMOOC, we explored the idea of the Internet as Public Sphere. I wrote about it here and here and here. 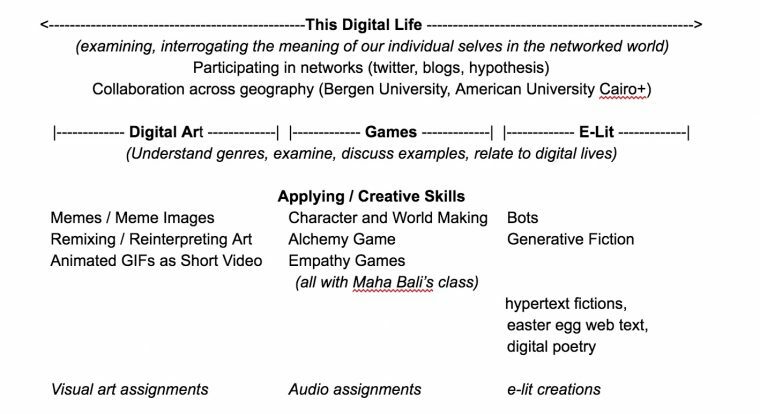 As Networked Narratives hits the last lap this week (it has been an interesting exploration of digital narratives, with a graduate class at Kean University and a bunch of folks, like me, out here in the open), I want to reflect on a project that took hold in the last weeks of NetNarr. Specifically, the invention of an alternative, or mirrored, Self in the NetNarr world called Arganee. 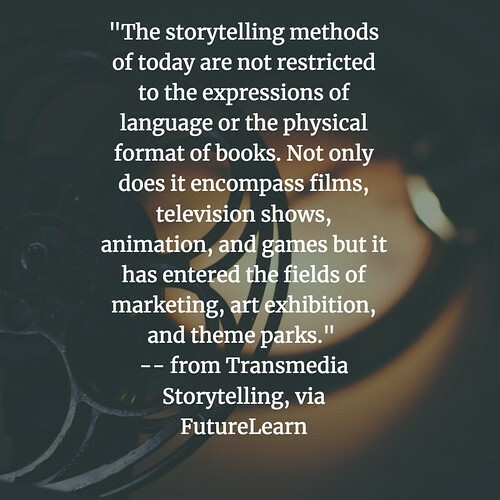 When I say “World,” I want to be clear that we never did enter or create a real fictional world – like video games do, for example — but one of creative imagination, through an online portal into Arganee. (Essentially, a blog site with hidden doors and strange text features). We imagined it a world. 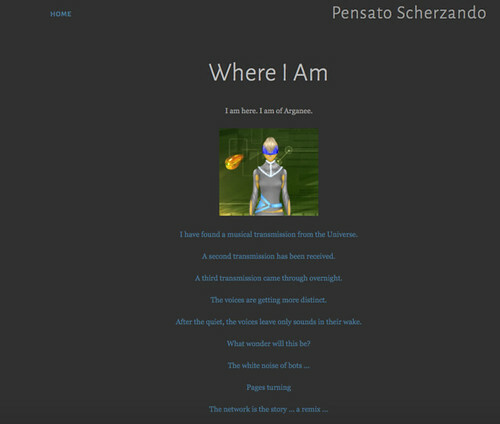 Our task was to create an alternative personality for the Arganee World, and after some thought, I created a character called Pensato Scherzando. Both words in the name are musical terms, which come together to create a definition of “imaginary music created, playfully.” Or something like that. Music. Play. Imagination. 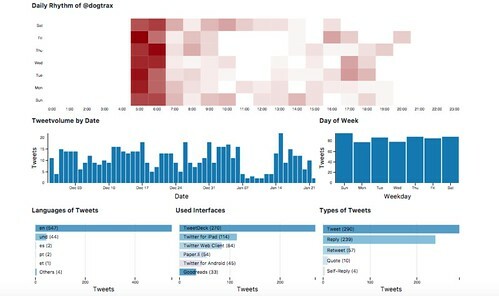 We created a “home” in the Arganee World site, and created a Twitter account for our characters, and our health and growth was tracked based on interactions with others and how much writing and media making we ended up doing. I also created an alternative home elsewhere, as a collection point for media files. 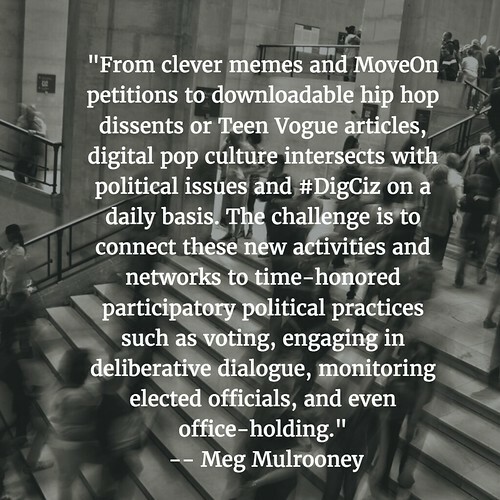 Prompts encouraged collaboration (although I never really found a place to collaborate) and connection, and the overall theme of Civic Imagination and Social Activism (through World Building) emerged in the final days. I found it intriguing to invent a persona out of the blue, and although I had some ideas for her, the voice of my Pensato emerged rather on its own. Pensato became a collector of sounds, a remixer, whose Sound Collector Array is pointed to the Universe, seeking music and messages from somewhere “out there” in hopes of some larger understanding of the world(s). I tried to infuse her speech with metaphysical tics, always urging her readers to “listen” to the Universe. Pensato is a collector, a poet, an interactor, an actor on the virtual stage, an optimist with hope that there are ways to mend the fabric of the world(s), if only we pause and listen and help each other. I went about creating audio files from the Universe that Pensato could share out (I don’t know if anyone was really listening, though). My aim was to find ways to create music and mystery, never quite giving away what Pensato was hearing. I wish I had had some master plan that would have ended in some symphonic conclusion but alas, I was winging it. Her voice was my voice, but not yet my voice. She became herself, or at least some projection of what I hope we could all become if we just took the time to pay attention to each other. Listening requires attention. We don’t listen nearly enough. Pensato did, or does. For a final assignment, she wrote me a letter. You can read it, too. PS – Special thanks to professors Mia Zamora and Alan Levine for inviting us to join the graduate students on this adventure. The Dilemma of Digital Texts: Who Owns What’s on the Web? 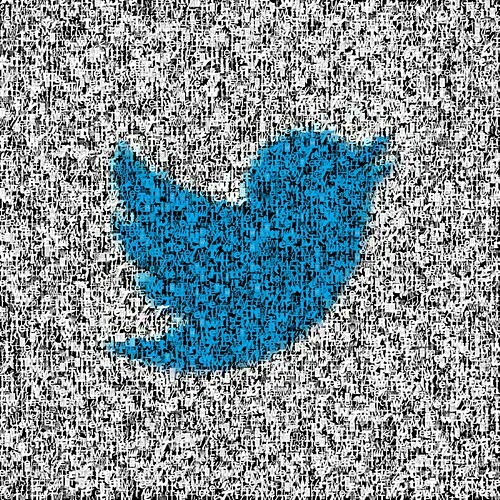 An interesting, and quite challenging, discussion unfolded on Twitter this past weekend that centered on the concepts of crowd annotation tools and content that can found on the open web. Tools like Hypothesis (which I use pretty regularly) allow you to annotate most websites and blogs, creating a digital margin side area for discussion. The benefits seem obvious to me: crowd annotation provides a space for engaging group discussions about specific texts and ideas, generating new and expanded understanding of the digital pieces that we are reading. But the provocative question was raised by a writer with a large audience (one whom I read regularly and support via Patreon): Who owns that original text (that content which is being annotated in the digital margins) and how much say do they have over whether the annotation should even happen in the first place? This particular writer used a web script to shut down Hypothesis and other annotation tools at their site. It’s not a clear-cut issue, at least in my mind, and a long discussion on Twitter between nearly a dozen people (including the writer, for a bit, before they became angered by the discussion and asked to be left alone) revealed the complexities of ownership of content, and what relationship the writer has with their readers when posting something to the open web. 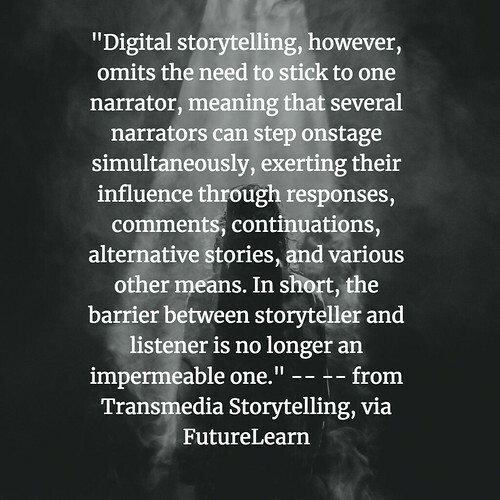 I find myself appreciating a writer’s desire to be able to control what is being done at their website or blog, and understand the sense of being concerned about what people are doing in the margins of an original text. Sure, comments potentially do open up that discussion, too, but let’s face it, the comment sections of many sites — particularly those run by women with strong opinions — often get overrun by those with nothing better to do in their petty lives than leave vicious comments and provocative, and perhaps profane, words. The worry is that someone writing in the digital margins will be malicious, too, and the writer would have little (at this time, anyway) recourse. This is a legitimate concern, as any perusal of comments at YouTube will tell you. (Hypothesis is close to adding some new functions for flagging content and has been mulling over this very concept of writer’s rights). To be honest, I have yet to come across anything like that in Hypothesis. I believe tools like Hypothesis give space for collaborative discussions, allowing the margins of the text to come alive with conversation and questions and associative linking that extends the thinking of the original writer. It empowers the reader, although perhaps that empowerment comes at the expense of the writer’s authority over their own words at that point. Personally, I use Hypothesis to closely read online texts, to examine and think, and to bounce ideas off the text to others in the margins, who help push my own thinking forward or force me to re-examine my beliefs and ideas. Your text, if posted to the web, can become a source of inspiration for me, and others. That’s a real gift to your readers. Clearly, not everyone thinks this way. Who owns the text once a writer makes it public on the Web? PS — There were other nuances to the Twitter discussion that I did not capture here — including the right to be forgotten in a connected world; obligations and compacts (or not) to readers who financially support the writer who is not wanting to be annotated; and what role a text has in the public sphere. PSS — I purposely did not name the writer because they clearly were upset that their decision was being questioned, and I did not want to make their situation any worse. Besides, the individual case here is less important than the larger discussion. Thanks to my friend, Daniel, for sharing this intriguing map-building/story-telling site with us on Twitter called Story Maps a few weeks ago. 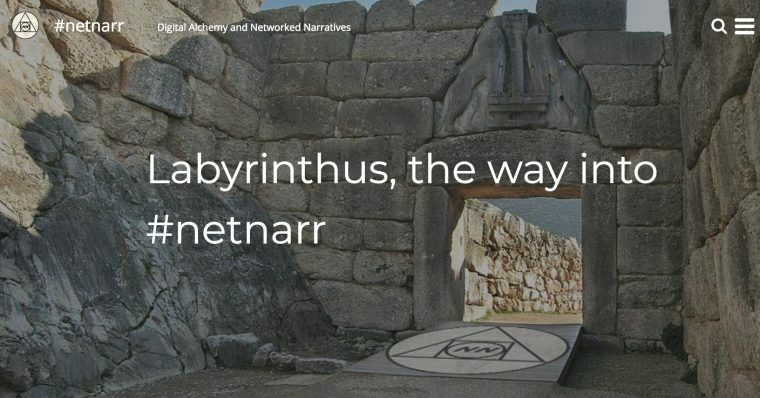 As we continue to dive into Networked Narratives (NetNarr), I wonder if this kind of mapping site might be a useful resource for building maps and worlds, with stories. Or this one, about economic inequities in American cities. 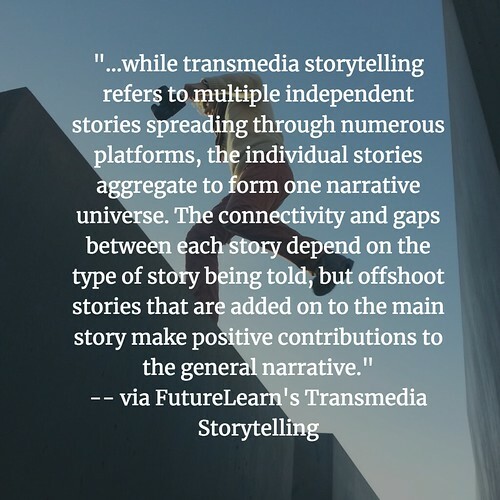 I am not sure how this Story Maps site might be useful for consideration of Networked Narratives — which has shifted into interactions around fictional worlds. 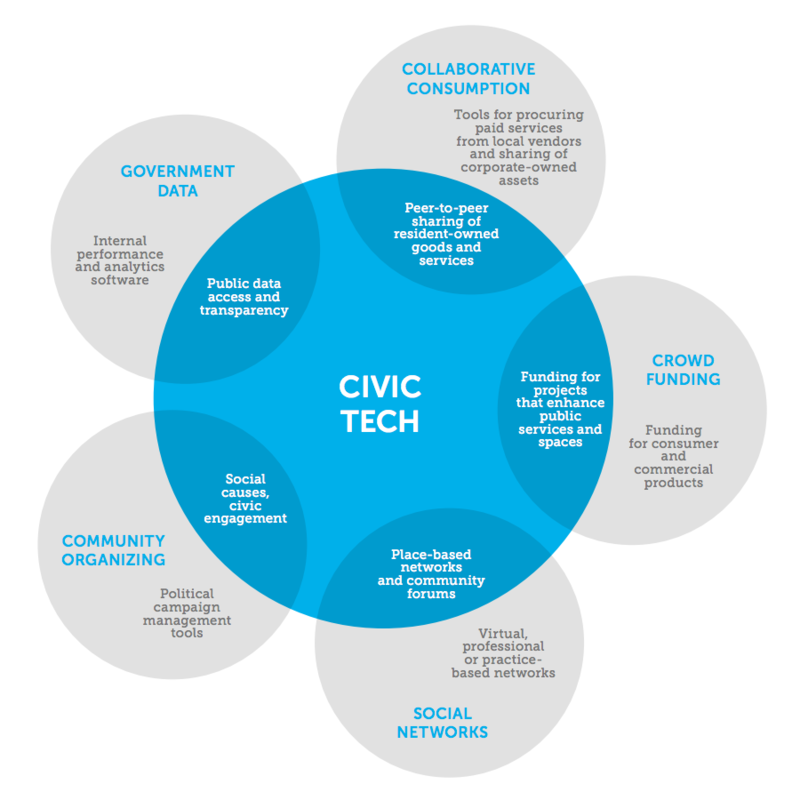 But the underlying idea is to nurture a “civic imagination” so that we can make the world a better place (or that’s how I am understanding it right now) and maybe these kinds of maps as stories might allow us another entry into that concept..